One Rosemary Chukwu of No. 33, Omo Ologede area in Majidun, Lagos has been alleged to have stole the seven-year-old child of her neighbour, Mrs. Gloria Emeka. 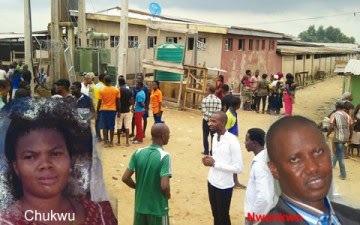 A neighbour of the kidnapper by name Biola Odunsin, narrated how he, in conjunction with other neighbours, caught Chukwu. He said, “It was around 6.30am today (Wednesday), when the mother of the child raised the alarm that she could not find her son, Emmanuel. “We all rallied around her to find out what happened. She informed us that she had sent him to fetch water from the well in the compound. She raised the alarm because her son took too long and when she went to the well, she only saw the empty bucket the boy took there. According to Punch, another neighbours who also took part in the search for the child said that Rosemary Chukwu even asked him to see whether the child was in another compound not far from the house. Two other neighbours named Yakubu and Vincent told our correspondent that they entered the well where the child was sent to fetch water. “We entered the well to see if the boy fell inside but we found nothing,” they said. But while the search for the child was going on, Chukwu was said to have gone inside her apartment and came out with a large luggage. “She carried the luggage on her head and passed by us as we searched for the child. She said she needed to drop the bag somewhere and that she would come to join the search later,” Odunsin said. But a suspicious woman, the wife of the landlord of the house, alerted the search party, telling them to search the bag Chukwu had on her head before she was allowed to leave. When the residents called after her to tell her to bring the bag for a check, she reportedly began to run. But a moment later, she was caught. “We immediately opened the bag and inside was Emmanuel with a cloth used to gag him. The child would have died because he could not speak again. We tried hard before we could resuscitate him,” Odunsi explained. However, the infuriated neighbours descended on Chukwu and while they were beating her, she screamed out that they should spare her because she was only a messenger. “Pastor Ernest sent me! Please don’t kill me, Pastor Ernest sent me o!” she was reported to have told the party of residents. Then Chukwu took the party to the church of the pastor who she claimed sent her, which turned out to be Pastor Ernest Nwankwo of the Holy Family Happy Family Ministry (House of Mercy), Majidun. One of the residents who took Chukwu to the church said by the time they got there, the pastor was nowhere to be found. She was later handed over to the police who took her away. Chukwu is a plump, fair complexioned woman with a motherly face. She is said to have four children – two boys and two girls. Neighbours said they had not seen her husband, as he was usually away from home even though they are still together. When our correspondent visited the church on Wednesday, a crowd of residents had besieged the place, barely kept at bay by some sternly looking policemen who were said to have prevented the church from being burnt down earlier by angry residents. Despite this, some youths had succeeded in entering the church before the police came and seized hundreds of audio CDs of an album recorded by the pastor. The youths publicly and excitedly sold the CDs on the Ikorodu Road to motorists and passers-by for N50 each. The policemen rebuffed every attempt to gain access to the empty church, while residents of houses nearby could not provide any information about the whereabouts of the pastor. Some residents who pleaded anonymity informed Saturday PUNCH that the church was not a conventional one. “They don’t hold service on Sundays, only on Tuesday and Thursday. The pastor claims to treat mad men,” one of them told our correspondent. An eyewitness, who entered the church before police intervention, said when they stormed the church earlier, they met a man with his hands and legs shackled in chains. “I am not a mad man. Please help me! I was taken from around Redeemed Church Camp on the Lagos-Ibadan Expressway. Pastor Ernest kept me here. There were many of us but they usually come to take away,” the man, who gave his name as Onuora Okeke, was reported to have said. The man also revealed to the people that he was from Anambra State and had been locked up in the church since 2012. Our correspondent learnt the man was taken away by the police. The Police Public Relations Officer, Ngozi Braide, said the Chukwu would soon be transferred to the Criminal Investigation Department, Yaba for investigation. She also confirmed that the pastor of the church has not been found. Our correspondent attempted to contact the Nwankwo through two phone numbers found on his church’s website but none of them were available as of press time.